The 1922 NFL season was the third regular season of what was now called the National Football League (NFL); the league changed their name from American Professional Football Association (APFA) on June 24. The NFL fielded 18 teams during the season, including new league teams such as the Milwaukee Badgers, the Oorang Indians, the Racine Legion, and the Toledo Maroons. Meanwhile, the Chicago Staleys changed their name to the Chicago Bears, and the Racine Cardinals changed their name to the Chicago Cardinals. The Muncie Flyers, Cleveland Indians, Brickley's New York Giants, Cincinnati Celts, Tonawanda Kardex, Washington Senators, and Detroit Tigers dropped out of the league. A 19th team, the Youngstown Patricians, was scheduled to join the league, and had its schedule laid out, but folded before playing in the league. A 20th, the Philadelphia Union Quakers, also was set to join, but did not, due partly to the fact that the Quakers were merely a front for the existing Buffalo All-Americans to play extra games on Saturday. After a four-year hiatus, the Quakers instead joined the American Football League (1926). Carl Eller is a former professional American football player in the National Football League (NFL) who played from 1964 through 1979. He was born in Winston-Salem, North Carolina and attended the University of Minnesota. He was elected to the Pro Football Hall of Fame in 2004. Dwight Eugene Stephenson is a former professional American football player. He was a center for the Miami Dolphins of the National Football League (NFL) from 1980 to 1987. He played college football under coach Bear Bryant at the University of Alabama. Stephenson was inducted into the Pro Football Hall of Fame in 1998. William J. George was an American football player. He played professionally as a linebacker for the Chicago Bears and the Los Angeles Rams of the National Football League (NFL). Alphonse Emil "Tuffy" Leemans was an American football fullback and halfback who played on both offense and defense. He was inducted into the Pro Football Hall of Fame in 1978 and was named in 1969 to the NFL 1930s All-Decade Team. Carl E. Banks is a former American football linebacker in the National Football League. He played from 1984 to 1995 for the New York Giants, the Washington Redskins and the Cleveland Browns. Jay Brian Schroeder is a former professional American football quarterback. He played college football at UCLA, after which he was selected in the third round of the 1984 NFL draft by the Washington Redskins where he played for three seasons. He then played for the Los Angeles Raiders for five seasons and spent one season each with the Cincinnati Bengals and Arizona Cardinals. Daniel Oliver Hampton also known as "Danimal" is a retired Hall of Fame American football defensive tackle who played twelve seasons for the Chicago Bears from 1979 to 1990 in the National Football League (NFL). He was elected to the Pro Football Hall of Fame in 2002. He currently hosts the Bears postgame show on WGN Radio in Chicago. Friedrich W. "Fred" Steinfort is a former American football placekicker in the National Football League who played for five different teams from (1976–1983). He played college football at Boston College. When Steinfort won the Oakland Raiders' kicking job just before the start of the 1976 NFL season, he sent the NFL’s current all-time leading scorer, George Blanda with 2,002 points, into retirement. In 1979, when he assumed the same role with the Denver Broncos, it was Jim Turner, at that time the NFL’s third-leading scorer with 1,439 points that he displaced. The 1979 Washington Redskins season was the franchise's 48th season in the National Football League. The team improved on their 8–8 record from 1978 and finishing 10–6. While the Redskins were able to improve their record, however, they were eliminated from playoff contention on the final week of the season when facing the Dallas Cowboys with the NFC East title on the line, Cowboys quarterback Roger Staubach led a last-minute comeback to defeat Washington 35–34 to win the division; which combined with the Chicago Bears defeating the St. Louis Cardinals 42–6, resulted in the Redskins losing a points tiebreaker for the final wild-card slot. The following is a list of players that were named to the Associated Press All-Pro Team, the Newspaper Enterprise Association All-Pro team and the Pro Football Writers Association, and Pro Football Weekly All-Pro teams in 1979. Both first- and second- teams are listed for the AP and NEA teams. These are the four All-Pro teams that were included in the Total Football II: The Official Encyclopedia of the National Football League and compose the Consensus All-pro team for 1979. The 1969 Miami Dolphins season was the team's fourth season, and their final season in the American Football League (AFL). This was the final season for George Wilson as head coach, as Don Shula was hired next season and coached the team for the next 25 seasons until 1995. The team looked to improve on their 5–8–1 record from 1968. However, the Dolphins struggled from the season's start, losing their first 3 games before tying the Oakland Raiders and losing their next 2 games to start the season 0–5–1. After their week 7 win over the Buffalo Bills, the Dolphins would end the season with a 3–10–1 record. Their week 10 loss to the Buffalo Bills would be the last time the Dolphins lost to the Bills until 1980, as the Dolphins won 20 straight against the Bills from 1970–1979. This became known as "The Streak", as it set an NFL record for longest winning streak for one team against one opponent, which, as of 2018, is still an NFL record that has not been seriously threatened. 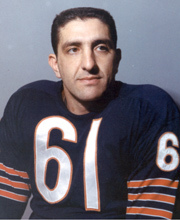 George Leo Connor was an American football player for the Chicago Bears of the National Football League (NFL) from 1948 to 1955. He played tackle on offense, and on defense was recognized as one of the sport's first linebackers. He is a member of the Pro Football Hall of Fame and of the College Football Hall of Fame. He attended both the College of the Holy Cross and the University of Notre Dame. He won the first Outland Trophy as the best college lineman in 1946. Sportswriter Grantland Rice once observed Connor was "the closest thing to a Greek God since Apollo." ↑ 1979-1970 Necrology at Oldest Living Pro Football Players Archived 2015-08-07 at the Wayback Machine . ↑ "Carl George". Pro-Football-Reference.com. Retrieved 2011-06-29.